The Formax FD 8906CC Industrial Shredder offers high capacity for shredding large volumes of material, and can serve the needs of an entire organization. It's powerful enough to shred just about anything including entire files, stacks of computer forms, cardboard, tapes, CDs and magnetic disks. 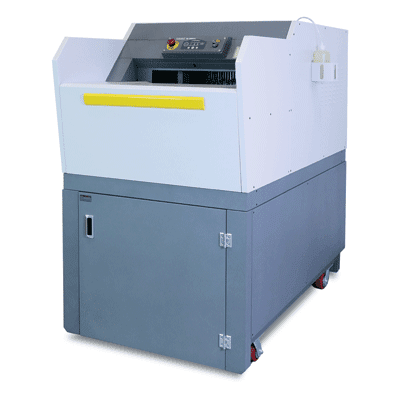 The FD 8906CC Cross-Cut model can shred up to 650 sheets at once, up to 35 feet per minute, with a shred size of 5/16" x 1 1/2" - 3". Features include an LED Control Panel with digital load indicator, Auto Start/Stop, Auto Reverse and Auto Cleaning, and front waste bin access, to allow for placement against a wall. The newly-redesigned waste bin has two side-by-side compartments. This makes the waste bin much easier to empty with two smaller canvas bags instead of one large bag. The waste bin is also easier to slide in and out of the shredder, thanks to high-quality guide rollers on both sides of the internal frame. The original single-compartment waste bin is still available as an option. The EvenFlowTM Automatic Oiling System is a standard feature which lubricates the all-steel cutting blades, helping to keep the shredder in peak operating condition. In addition, an optional Ouput Conveyor Belt System is available for the FD 8906CC which transports material out of the shredder and into an external waste bin, increasing capacity and decreasing down time between emptying and replacing the waste bin. Key FeaturesHigh-capacity. Up to 650 sheets at once. LED Control Panel. Shreds entire files & more. Automatic Oiling System. Optional output conveyor.